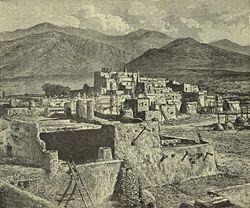 Taos Pueblo. Photo by David Slauson, 1999. Taos Pueblo (or Pueblo de Taos) is an ancient pueblo belonging to a Taos (Northern Tiwa) speaking Native American tribe of Pueblo people. It is approximately 1000 years old and lies about 1 mile (1.6 km) north of the modern city of Taos, New Mexico. The Red Willow Creek, or Rio Pueblo, is a small stream which flows through the middle of the pueblo from its source in the Sangre de Cristo Range. A reservation of 95,000 acres (384 km²) is attached to the pueblo, with about 1,900 tribal members living in the area. Taos Pueblo is a member of the Eight Northern Pueblos. Its most prominent architectural feature is a multi-storied residential complex of reddish-brown adobe divided into two parts by the Rio Pueblo. It is believed to have been built in the fourteenth or fifteenth century, following the disappearance of the Anasazi tribes from drier lands in the Four Corners region. Today Taos Pueblo is home to approximately 150 people who live in the traditional manner, with no electricity or running water, and is one of the oldest continuously inhabited community in the United States. 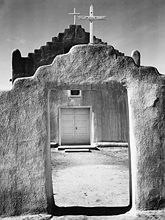 Taos Pueblo was designated a National Historic Landmark on October 9, 1960, and in 1992 became a UNESCO World Heritage Site. Additional World Heritage Sites honoring the Pueblo peoples are Casas Grandes in northern Mexico, Mesa Verde in southwest Colorado, and Chaco Canyon in northwest New Mexico. Taos Pueblo is considered a remarkable example of a traditional type of architectural dwelling from the pre-European period of the Americas. Due to the determination of the Native American community, it appears to have successfully resisted the pressures of modern society. 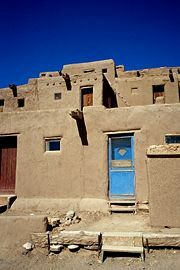 In the Taos language, the pueblo is referred to as "the village." The proper name of the Taos Pueblo is ȉałopháymųp’ȍhə́othə̀olbo "at red willow canyon mouth" (or ȉałopháybo "at the red willows" for short); however, this name is more commonly used in ceremonial contexts and is less common in everyday speech. The name Taos in English was borrowed from Spanish Taos. Spanish Taos is believed to be a borrowing of Taos tə̂o- "village" which was heard as tao to which the plural -s was added although in the modern language Taos is no longer a plural noun. The once popular explanation that the Spanish Taos came from tao "cross of the order of San Juan de los Cabelleros" (from Greek tau) is unlikely. The Pueblo People are a diverse group of Native Americans once spread throughout a wide geographical range of northern Mexico and the Southwestern United States. Today their descendants reside mainly in New Mexico, Texas, and Arizona in the U.S., and in the Mexican state of Chihuahua. They have traditionally subsisted on agriculture. Located in the valley of a small tributary of the Rio Grande, Taos Pueblo is an exceptionally well-preserved pueblo in the northernmost reaches of Pueblo territory. It comprises a group of dwelling places and ceremonial centers representative of a culture largely derived from the traditions of the prehistoric Anasazi tribes. Most archeologists believe that the Taos Indians, along with other Pueblo Indians who eventually settled along the Rio Grande, had migrated from the Four Corners region, whose ancient dwellings had been inhabited by the Anasazi. The cultures there went into an irreversible decline, and in the late 13th century major sites like Mesa Verde and Chaco Canyon were abandoned, perhaps due to major climatic changes including a long drought. It is believed that Taos appeared before 1400, following the disappearance of the Anasazi tribes from the Four Corners region. The communities of the Anasazi were characterized by common social and religious structures. Their traditional agricultural practices perfected during the classical period, and a systematic use of irrigation, were used. Taos Pueblo was first visited by Europeans in 1540. In 1598 Mission San Gerónimo de Taos was founded. Rebuilt on three separate occasions, the mission was officially abandoned in 1846. The plotting of the Great Pueblo Revolt of 1680 was centered in Taos Pueblo. A response to Spanish mistreatment of the Native peoples, this regional uprising drove the Spanish out of New Mexico until 1692. The Pueblo endured a siege by U.S. forces in 1847, and experienced the return by President Nixon in 1970 of the Pueblo's 48,000 acres (194 km²) of mountain land taken by President Theodore Roosevelt in 1906 and designated as the Carson National Forest. Blue Lake, which the people of the Pueblo traditionally consider sacred, was included in this return of Taos land. The re-acquisition of the sacred Blue Lake is considered the most important event in its history due to the spiritual belief that the Taos natives originated from the lake itself. Its return is considered a tribute to the tenacity of Pueblo leaders and to the community's commitment to guarding its lands for the spiritual, cultural and economic health of the Pueblo. The return of this land capped a long history of struggle. An additional 764 acres south of the ridge between Simpson Peak and Old Mike Peak and west of Blue Lake were transferred back to the Pueblo in 1996. A number of the Pueblo settlements established in the late thirteenth and early fourteenth centuries in the valleys of the Rio Grande and its tributaries have survived to the present. Exceptional among these is Taos, in the fact that it has retained the original layout and distinctive style of architecture virtually intact. This provides an illustration of the traditional way of life and community characteristics of its ancient inhabitants. The village today appears at first glance to conform with the description given in 1776 by Fray Francisco Atanasio Dominguez. However, numerous modifications can be observed. On the village's west side, the missionaries’ convent and church lie in ruins. During the nineteenth century a new church was built on the west of the north plaza. The original form and outline of the adobe dwellings remain, but details have been changed. Exterior doors are now common, as are windows which were once small and sparse. This reflects the acculturation of European traits, as well as the lessening of the structures' use as defensive fortifications. Ovens were traditionally located only outdoors, but fireplaces have been added inside the living quarters. While the social and economic climate have engendered such changes, a policy exists mandating all repair and reconstruction work be carried out using traditional techniques and materials that are harmonious with the original structures. 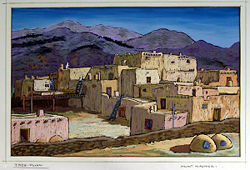 Taos Pueblo (1935-1936), painting by Helmut Naumer, Sr. The north-side Pueblo is said to be one of the most photographed and painted buildings in the Western Hemisphere. It is the largest multi-storied Pueblo structure still existing. It is made of adobe walls that are often several feet thick. Its primary purpose was for defense. Up to as late as 1900, access to the rooms on lower floors was by ladders on the outside to the roof, and then down an inside ladder. In case of an attack, outside ladders could easily be pulled up. The pueblo wall completely encloses the village except at the entrance as a symbol of the village boundaries. Now rather short, the wall was once much taller for protection against surrounding tribes. The river running through the pueblo serves as the primary source for drinking and cooking water for village residents. In the winter, the river never completely freezes although it does form a heavy layer of ice. Because the river water moves so swiftly, the ice can be broken to obtain the fresh water beneath. The Taos tribe, who is deeply conscious of its heritage, administers Taos Pueblo. The material expression of that heritage is evident in the buildings of the settlement. Maintenance and restoration work is carried out by a special team, all tribal members, who share scrupulous commitment to the use of traditional materials and techniques. While Taos Pueblo remains a traditional settlement, only about 150 people reside within the enclosure. Many tribal members return only seasonally for ceremonial functions, while residing nearby in modern dwellings. In addition, its Visitors' Center is increasingly assuming the role of a tourist attraction. While the tourist trade is an important economic base, the tribe fears the possibility of that becoming the central focus of the site. As a sovereign nation within the United States, preserving the ancient traditions in the face of advancement of "modernization" is a prime concern. Ancient apartment-style dwellings at the Taos Pueblo. Taos Pueblo dwellings have changed little in 1,000 years. Approximately 150 people live full time within the Pueblo walls. The two main structures (Hlauuma, or north house and Hlaukwima, or south house) are of similar age, more than 1000 years old. They are believed to be the oldest continuously inhabited communities in the country. Approximately 1,900 Taos Indians live on Taos Pueblo lands. Many who own apartments within the Pueblo live in summer homes near their fields, and in more modern homes outside the old walls but still within Pueblo land. Tradition dictates that neither electricity nor running water be allowed within the Pueblo walls. The Tribal Council, a group of some 50 male tribal elders, appoint a tribal governor and war chief and their staffs annually. Civil and business issues within the village and relations with the non-Native world are overseen by the governor. The war chief deals with the protection of the mountains and tribal lands outside the Pueblo walls. An elementary school, maintained by the Bureau of Indian Affairs operates within the Pueblo walls. There is an education committee comprised of Pueblo members who oversee the education of students and monitor a scholarship program for those wishing higher education. Children also attend public schools in the nearby city of Taos. Three religions are represented in the Pueblo: Christianity, the Native religion, and the Native American Church. Most of the Indians are Roman Catholic. Saint Jerome, or San Geronimo, is the patron saint of the pueblo. The deep feeling of belonging to a community, summed up in their phrase, “we are in one nest,” has held the Taos people together. Both men and women are expected to offer their services or “community duties,” when needed. One should be cooperative and never allow their own desires to be destructive of the community’s interest. One of Taos peoples' strongest institutions is the family. Descent on both the father and the mother’s side of the family is equally recognized. Each primary family lives in a separate dwelling so when a couple gets married, they move to their own home. With relatives nearby, everyone is available to help care for the children. The elderly teach the young the values and traditions that have been handed down, which protects the integrity of the Taos culture. ↑ George L. Trager, 1960. "The name of Taos, New Mexico." Anthropological Linguistics 2 (3): 5-6. ↑ 4.0 4.1 4.2 Taos Pueblo. About Taos Pueblo Retrieved December 17, 2008. ↑ Bulk Resource Organization. PUBLIC LAW 104–333—NOV. 12, 1996 Retrieved December 17, 2008. ↑ 6.0 6.1 UNESCO World Heritage Centre. Advisory Body Evaluation Retrieved December 17, 2008. National Park Service. Taos Pueblo Retrieved December 16, 2008. TaosWebb. Taos Pueblo - A thousand years of tradition Retrieved December 16, 2008. UNESCO World Heritage Centre. Pueblo de Taos Retrieved December 17, 2008. This page was last modified on 16 November 2015, at 17:01.